The Navy offers monetary bonuses for enlisted sailors who agree to re-enlist in "shortage" Ratings (jobs). The amount of bonus depends on the "Multiplier" assigned to the rating, the individual's rate (rank), the member's time in service, and the number of years the individual re-enlists for. Zone A - Sailors who re-enlist with between 17 months and 6 years of service. Zone B - Sailors, who at the time of re-enlistment have between 6 years and 10 years of service. Zone C - Sailors who re-enlist with between 10 and 14 years of service. In 2004, the Enlisted Supervisor Retention Program was expanded to include sailors with between 16 and 20 years of experience. 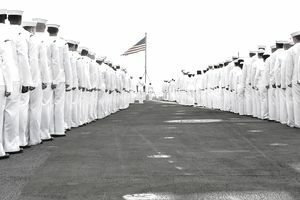 Because the Navy is close to its retention goals for those sailors, their re-enlistment bonuses are much less than bonuses for sailors with between 10 and 16 years of experience. Below are the Bonus Multipliers established by the Navy. This list was current as of 16 August 2012. Bonuses are subject to change. For the very latest in enlistment bonuses, check the Navy NAVADMIN Messages.